A St John Ambulance volunteer on the Isle of Man who has given 68 years of service to the charity has received the British Empire Medal. First aider Mary Bridson, who is 79 and from Douglas, joined as a cadet at the age of 11 and has taught hundreds of people how to save lives. The charity's John Gill said they would be "lost without her". 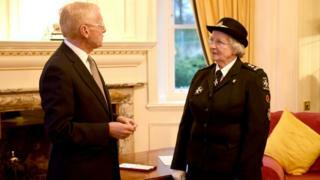 Mrs Bridson said she was "delighted" to receive the honour at a special ceremony at Government House. She said: "I've put a lot into St John, but I've always got a lot out." Having held multiple roles, she currently serves as a personnel officer keeping members' records up to date and helping out with fundraising. She said retiring is "not on her agenda" and she hopes to continue working for the charity as long as she can. The Lieutenant-Governor's private secretary, Wing Cdr Diane Kelsey, said her "extensive knowledge" had made her a "vital member of the team for more than half a century". After joining the charity in 1950 she worked her way up the ranks to become a commander in 1999. When named in the New Year Honours List she described her recognition as "very unexpected".